The U.S. Open tennis match between Serena Williams and Venus Williams is certainly an exciting event in sports. But one fan couldn’t be more excited. George is a Golden Retriever, and he’s watching the action more intently than almost any fan in the world. In this YouTube video, George holds his own tennis ball in his mouth, much like a fan wearing a team jersey or holding a sign to cheer on their team. He’s got his nose pressed as close as he can get it to the screen. And when the ball starts moving, he’s ready to lose it. 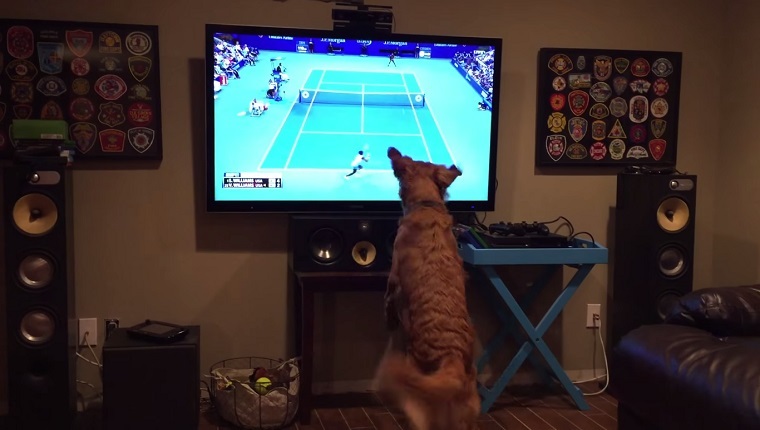 The pup jumps along, nipping at the ball as it flies back and forth across the court. Finally, it’s commercial time, and the pup settles down. There’s no tennis balls in the commercial break, and George seems a little disappointed. But once the match was back on, we’re sure he was ready to get moving again. His owner says George has 4 bones on Serena, so he’s got a lot riding on this.